When was the last time you familiarized yourself with the story of Robin Hood? Perhaps you’ve seen Disney’s foxy 1973 version or swooned over Kevin Costner in “Robin Hood: Prince of Thieves.” There’s also the more recent Ridley Scott version or the classic “Robin and Marian” starring Sean Connery and Audrey Hepburn. You should be able to easily find more than a few BBC miniseries as well. 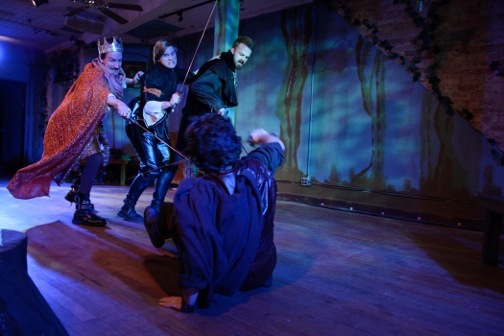 There’s no shortage of Robin Hoods available for you to watch (or read for that matter) but there is one version that you absolutely must see before its run is over and that is the world premiere of “Robin Hood and Maid Marian” at Strawdog Theatre. Adapted by Forks and Hope from Alfred Lord Tennyson’s poem “The Foresters,” this rendition of the Robin Hood legend captures the strength of Tennyson’s blank verse, which shines through the production with a delightful archaism that is nevertheless extremely accessible for the audience. The accessibility is in large part due to the perfect delivery of lines by every actor on stage, as if their native tongue was Victorian poetry. A sly humor regularly punctuates the performance. Pairs of actors symbolically dressed as birds or deer dash across the stage from time to time making cartoonish animal noises. At one point, a trio of birds takes center stage to sing. One of them grunts, squirms, squeezes and finally, after heroic, hilarious efforts, pops out an egg, which happens to be a maraca: the perfect instrument for the song that follows. But the play isn’t all fun and games. There is real angst in Maid Marian’s senile father losing his land as well as the injustice that has become law under King John. Marvelous fight scenes choreographed by Sam Hubbard use every inch of stage and serve to heighten the drama. Strawdog Theatre Company, 3829 North Broadway, (773)528-9696, strawdog.org. $15. Through December 29.